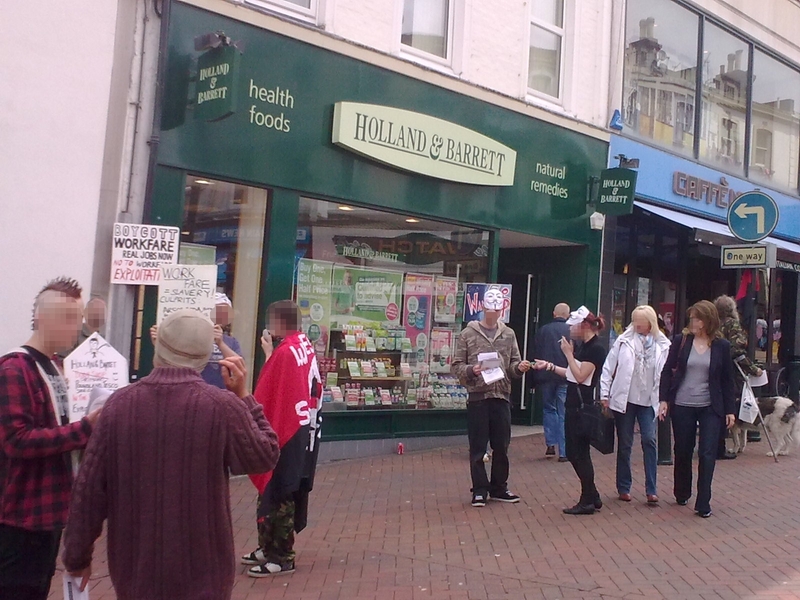 Keep up the pressure on Holland & Barrett! A spur of the moment picket was called by Bournemouth Uncut and Occupy in solidarity with comrades in Liverpool on Saturday 23rd. It was well attended, supported by members of BPACC and Solent Solfed. 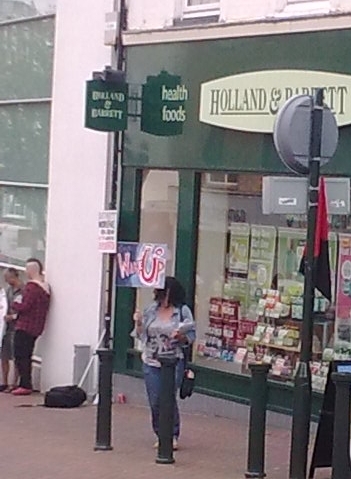 Two shops picketed; police called in relation to attachment of flags and placards to street furniture, despite the plethora of bunting and advertising material in the precinct – we were only asked to take it with us when we’d finished. At the arcade, the security prat in the jeweller’s next door asked us to go outside (there were two entrances, one inside, one out), another prat in a suit came out, he was asked to prove that he was an agent for the landowner. After variously claiming to be the owner, chairman of the committee and some company he couldn’t name, he “couldn’t be bothered to argue” and went back in to call the police – which he didn’t – so there you go. Calling on Anarchists, Anarchosyndicalists, Libertarian Socialists, Revolutionary Unionists, Platformists, Wobblies, non-aligned working class radicals and all those who want to celebrate 200 years of class struggle without marching under the banner of a political party or the business unions that affiliate to them. Bring your red/black/(A) flags and let’s start putting the libertarian left back into the consciousness of our class. We’re portrayed as a disorganised rabble – show ‘em we can get organised and march together as a group. 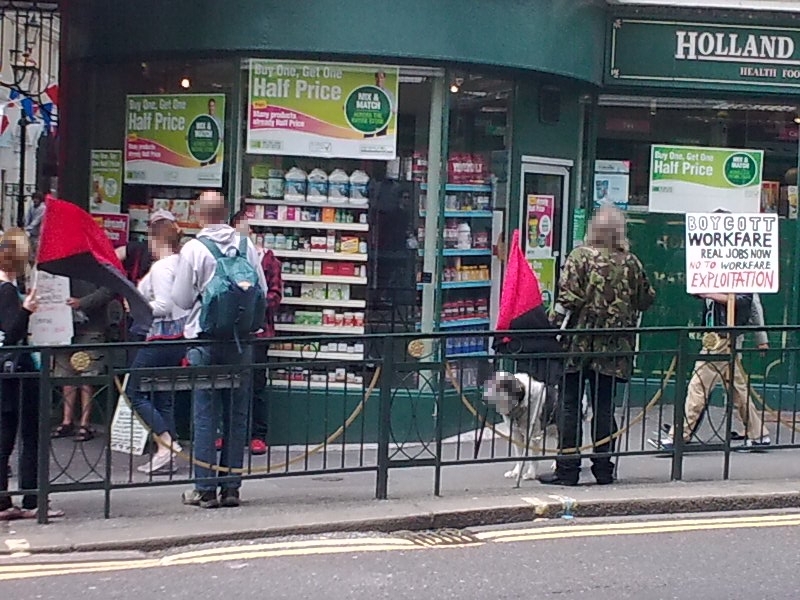 ‘I don’t know why the police don’t just let us sort it out, they (the fascists) would never dare show their faces in Brighton again,’ – Anti-Fascist campaigner. ‘Go on kids, See em off!’ – an elderly lady watching from the railings outside Brighton train station as around a gang of 100 had just legged it down the road in hot pursuit of the 30 fascists being taken to the train station by police. – Re-posted from A.F.N. There is no shortage of good, active comrades in the North so how did this happen? It seems the event was set up on Facebook and no attempt was made to call for support even after threats had been issued. 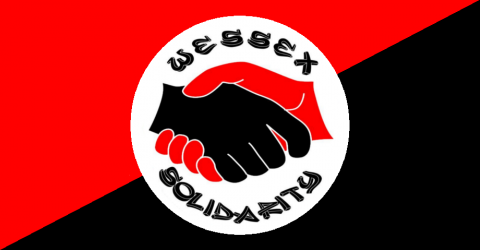 By contrast the network in the south is well supported and organised to the extent that about 100 anti-fascists turned out in Brighton without a public callout. Our experience has shown that any radical event is likely to attract fascists. Anyone arranging something like this should expect trouble and prepare for it, it’s still largely a numbers game – the police will always round on the smaller group. We urge all left-libertarian groups to sign up to the Anti-Fascist Network and work together to make sure the fash are never able to control our public spaces.